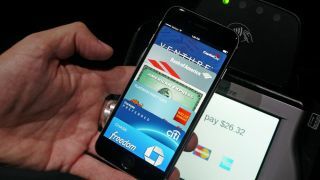 Apple Pay has begun its rollout, but not everyone is on board with the mobile payment service. Some retailers in the US are snubbing Apple Pay in their stores, and it's likely that this is being done in anticipation of CurrentC, a QR-based mobile payments platform that's set to launch next year. Wal-Mart, Best Buy, CVS and Rite Aid are currently not supporting Apple Pay or Google Wallet. The latter two actually supported Apple's service for the first few days, but have reportedly now stopped customers using NFC payments entirely. All of these retailers are part of the Merchant Customer Exchange (MCX), the collective that's building CurrentC. 7-Eleven, Dunkin' Donuts and Wendy's are also set to support the upcoming Apple rival, though it's not clear whether all of them will do so in place of Apple Pay, or whether some will choose to support both. But as CurrentC is set to be a direct competitor to Apple's service, it seems pretty obvious that these retailers are keeping Apple from encroaching on its own plans, even if QR-based payments don't sound like a great idea to us.